I know, big surprise, but life is not like Disney told us it would be. and you know what, good. I’m glad. I’m finding out that a lot of things lied to me. And I’m ok with it. Pixar lied to us too, you know. Like, Nemo? He would have died. Fish don’t survive with that kind of disability. It’s like, impossible. screw it, I would have eaten him. You get hungry in the wild, and it’s a fish eat fish ocean. I’m getting wildly off topic. This weekend I am heading out of town for my sister’s wedding. So I thought I would take a moment to check in with this. Marriage is hard, and they are both entering into it with their eyes open. This isn’t a disney dream, this is reality. But reality can also be really lovely too, and I wanted to take a second and point out at least one awesome ocean related lovey-dovey but real thing. 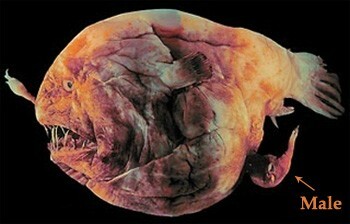 Anglerfish. There are a lot of animals they say that mate for life, but with further DNA testing find that mates have strayed. Not Anglerfish Anglerfish have to find each other in the inky blackness of the ocean. And once they do, they stick like glue. That bite and enzyme thing is wow amazing. Richer or poorer. Sickness or health. That’s what they did.